Chef/owner Pietro DeFazio opened his neighborhood restaurant in 1982 and is well known for serving rustic traditional Southern Italian cuisine. A long time local favorite, DeFazio’s, was recently recognized by The Wichita Register as the best west side “Quaint Italian Eatery”. Bringing together old family recipes and the freshest ingredients, DeFazio’s offers a varied menu of antipasta, pizza, seafood, grilled meats, and ample portions of home style pasta. Mainstays on the menu include Lasagna della Casa, Manicotti Carbonara, and Grilled Italian Sausage with Peppers as well as signature dishes such as Oven Roasted Braciole and Chicken & Artichoke Piccata. The dessert menu tempts diners with authentic sweet cannoli and homemade cream puffs. DeFazio's dining rooms are completely non-smoking, so guests can enjoy the delicious aromas from our kitchen. 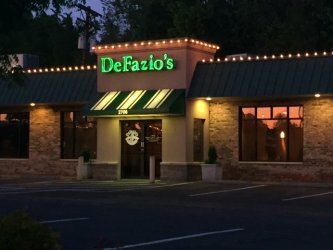 The combination of a friendly staff and comfortable dining room make DeFazio’s the perfect choice for a casual lunch or night out with family and friends. DeFazio’s also has a private dining room available by reservation for any special occasion. DeFazio’s is simple Italian food at its best!